There’s plenty of rhetoric about the strength of Tech City and, actually, no shortage of data: Graeme Evans, now a Professor of Design at Brunel, kicked-off the recent Creative Breakfast session on Tech City, giving an overview of data he collected while Director of the Cities Institute at London Metropolitan University. Graeme’s data highlighted the fact that the growth of digital businesses in and around Shoreditch and Old Street was part of a growing trend – both geographical and industrial. The industrial trend was towards a new kind of business, blending ‘creative’ and ‘technology’ businesses which are not easily quantified using traditional data-collection methods, but where data does suggest a very strong agglomeration in East London – a phenomenon which has been progressing over recent years. The geographical element is twofold: a drift east from Soho and Clerkenwell towards cheaper properties in the City Fringe; and the fact that this ‘agglomeration’ is part of a bigger London creative and digital cluster which has a strong focus centrally and west of London, as well as here in the East. The Breakfast Group spent the morning doing its own fieldwork, visiting a number of businesses and agencies, traversing east to west – from Mother and Ostmodern in Redchurch Street to Mother at the Trampery and City University in St John Street, via Berg, MakeShift, Google Campus and TechHub in Bonhill Street: a triangular journey which took in around 10 businesses. A snapshot, but a fairly full and intensive one. New technology providing new working models, the need for new applications, economies of scale. Shoreditch at the heart of an buzzing East (and North, and South) London. There has also been a lot of money coming from China and India, despite the economic slow-down in the West. * Getting products to what feels like it is a buyer’s market, with thousands, millions of applications and ideas to choose from. The risks are they fail, or sell out to somebody with a pre-existing brand/distribution channel, and it gets smothered…..
* Workspace: not enough and, inevitably, getting more expensive. For Tech City to survive, thrive and grow, it will require the support and intervention of a range of partners – public and private. 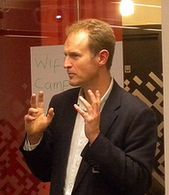 As Stian Westlake has noted recently, there has already been a move against complete de-regulation of the market, with local authorities successfully resisting Government attempts to loosen planning regulations which would encourage more residential property in an area crying out for cheap studio and work space. I’m grateful to Triston Wallace and his blog here, which has prompted this short reflection on culture and class. Some years ago, Richard Florida’s concept of the Creative Class was all the vogue – the idea of a whole stratum of society, a ‘class’ of artists, teachers, and a mix of other very broadly creative professionals, which was beginning to congregate in a number of US cities and generating economic growth and urban regeneration. Florida made much of the tolerance and diversity which characterised this group. I’ve always harboured an anxiety that Florida’s thesis is innately ‘classist’ – celebrating the values of an educated middle-class, while implicitly denigrating the values of traditional working class urban communities. This doesn’t undermine a core part of his thesis: that the economic and social dynamic in many of our most successful cities is being shaped by a new group of creative businesses and individuals. But Florida’s approach stikes me as worryingly straightforward, failing to engage fully with the tensions and community conflicts which cultural regeneration butts up against. Triston’s piece, referred to above, cites Hoxton – frequently referred to as an example of cultural and creative-led regeneration on the fringes of the city of London. Hoxton was traditionally a very poor white area of town. And, the chances are the locals are not as tolerant and diverse as the new creative types moving into their neighbourhood. The transformation of Hoxton into a buzzing creative district will have generated some trickle-down benefits for the local community, in their poor quality social housing. But to what extent are they, or have they, been involved in the changes taking place. Are they now setting up their own cultural enterprises, or hanging out in the cool cafes and bars? Or, more likely, do they continue to experience high unemployment, and shop at places like Iceland? Too often the ‘creative class’ which transforms neighbourhoods does so at the expense of local people, and sometimes local values and culture. And, by implication, the values underpinning that cultural transformation are far from tolerant and appear only to engage with ‘diversity’ so long as the diversity does not include the poor (very often white) communities left untouched by the gentrification of the area. That’s the challenge, by the way, in places like Hackney Wick, where it is planned that there will be a creative and digital cluster post-2012. There are, of course, examples of a more integrated – if not indigenous – cultural-led transformation, and I am certainly not arguing that cultural regeneration, and cultural and creative development are harmful for communities. Rather, my beef is with Florida and with others who push the importance the concept of the ‘creative class’ but who appear not to have much of a concept of ‘class’ at all. I’m not sure who it was who once said that ‘urban regeneration begins with poetry and ends with real estate’. While simplistic, there’s something very profound in here about the disempowering force of urban development which most ‘poets’ would want to resist. Arguably the most important set of documents affecting the culture and creative sectors in London have just been published. No, not the Arts Council’s funding plans, nor the Mayor’s Culture Strategy. Published today are the Mayor’s Economic Development Strategy, and his London Plan – or, at least, a draft of both. The latter setting out a strategy which seeks to make London’s shared space “more beautiful”. They are both available here. Don’t be fooled into thinking that the Culture Strategy is more important: in practice it is the London Plan which dictates how local government in particular, and a host of other local, regional and national governmental partners operate to support creative and cultural development. Setting out guidelines for cultural quarters, creative workspace, and for public space, the London Plan will have a significant impact on the health of the creative and cultural sectors over coming years. I’ve only had a skim read, but initial viewing suggests that Boris has a good handle on the issues – notwithstanding the predictable emphasis on assisting outer London. The Economic Development Strategy, meanwhile, appears less forthcoming about the role of culture and the creative sectors in supporting, stimulating and enriching the London economy. Despite passing references to London Fashion Week and Film Festival, it’s hardly teeming with ideas on how best to support and promote London’s second biggest sector. Given the parlous state of the LDA over recent years, maybe that’s no bad thing. On the other hand, even the Party of small government will know that public spaces don’t get beautiful all by themselves.